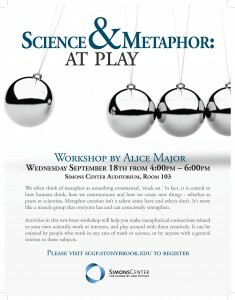 We often think of metaphor as something ornamental, ‘stuck on.’ In fact, it is central to how humans think, how we communicate and how we create new things – whether as poets or scientists. Metaphor creation isn’t a talent some have and others don’t. 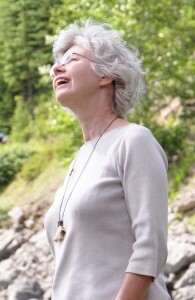 It’s more like a muscle group that everyone has and can consciously strengthen. 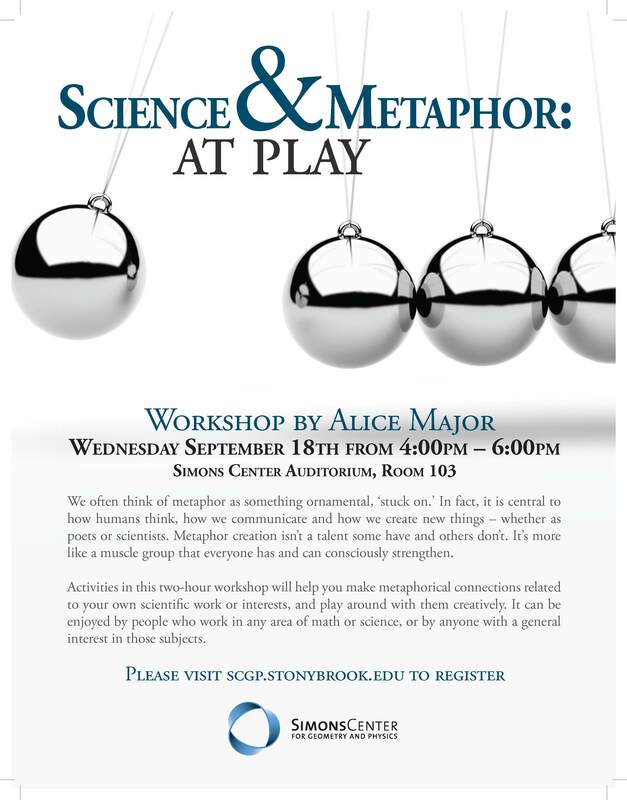 Activities in this two-hour workshop will help you make metaphorical connections related to your own scientific work or interests, and play around with them creatively. It can be enjoyed by people who work in any area of math or science, or by anyone with a general interest in those subjects. Alice Major will also give a lecture on Tuesday September 17 at 4:30pm in the Humanities building, room 1006 titled “Superposing Brains”. Popular stereotypes (which hardened throughout the last century) assume there are profound differences in the ways artists and scientists think. But poets and math majors both use the same basic brain set-up that has been evolving for billions of years, and share the same equipment for processing data from the world and creating meaning out of it. Human cognition can be thought of as a superposition of states, in which ‘artistic’ and ‘scientific’ are hopelessly entangled. Can we identify the differences?